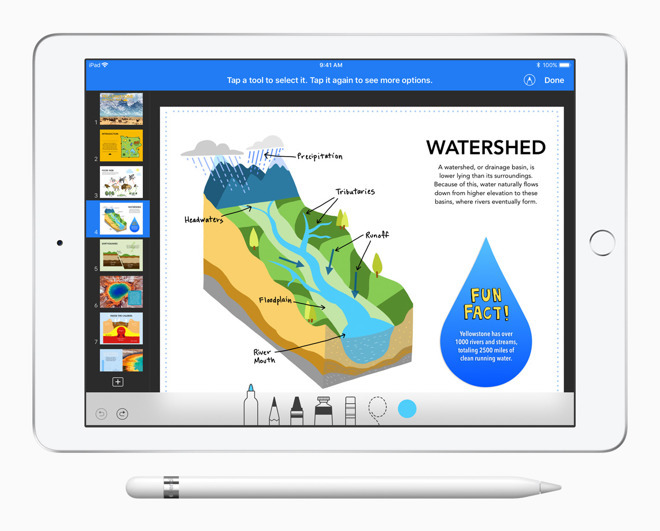 The updates allow students to add drawings, diagrams, and handwriting to documents, even in Numbers, Apple said. Teachers and others, meanwhile, will be able to markup documents using a Pencil. "Smart Annotation," currently only in beta, enables notes to be anchored to individual pieces of text. 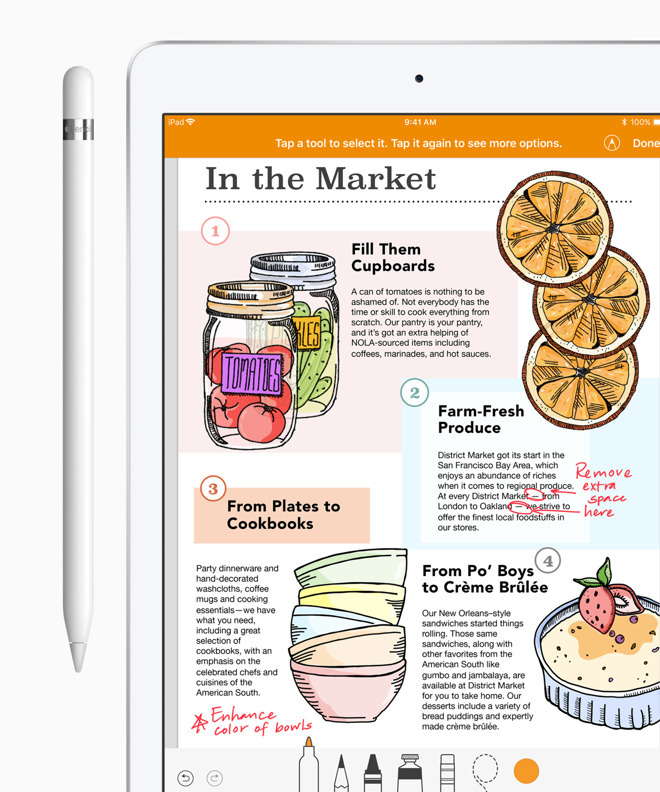 Pages for both iOS and macOS now incorporate digital book creation, eliminating the need for a separate app. A collection of templates is included, and books can be illustrated with existing images and videos or the new Pencil drawings. Real-time collaboration means several people can work on a book at a time, then share it as an iBooks file. Miscellaneous Pages improvements include a Presenter Mode, side-by-side page views including two-page spreads, and the ability to build "master" pages for consistent design. Documents can be in landscape or portrait, and Apple has also brought in donut charts, insertable image galleries, editable character and paragraph styles, conditional highlighting in tables, and further editable shapes. Numbers changes include the shapes, donut charts, conditional highlighting, and image galleries mentioned above, as well as new options for sorting and filtering tables, better CSV and text data import, and bidirectional flow of Arabic and Hebrew. Among unique Keynote improvements are animated drawings in slideshows, easier theme switching, and customizable slide sizes and aspect ratios. All three apps have gained integration with Box cloud storage, permitting real-time collaboration on documents saved there. Beyond supporting the Pencil, the new iPad sports an A10 processor, and starts at $329 for the public and $299 for schools. It otherwise holds on to last year's technology.